Impulse buy alert! We here at io9 have a thing for creepy fiberglass dinosaur sculptures (as seen at destinations like these). So we were visibly jazzed when tipster Laura informed us that someone was selling a 10-foot-tall, three-toed-sloth sculpture for a bargain $4000. 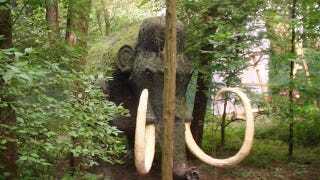 In 2011, the venerable Prehistoric Forest and Mystery Hill roadside attraction (seen below, in less closed times) was permanently shut down when the owners retired. Now, the Marblehead, Ohio attraction is attempting to sell off its back stock of fiberglass dinosaurs and prehistoric mammals. For example, you can buy that above mastodon for a mere $13,000 ("It has a photo eye that activates when someone gets too close then it sprays a fine mist of water about 20 feet"). Here's a sampling of the creatures they have on the market. "Plesiosaurus 13' (flippers move up and down) $15000 This model floats"